I just finished crocheting this striped reusable tote bag. Each year I crochet a recycled bag item for my local Relay for Life event. They use the donated items in gift baskets and for their fundraising. 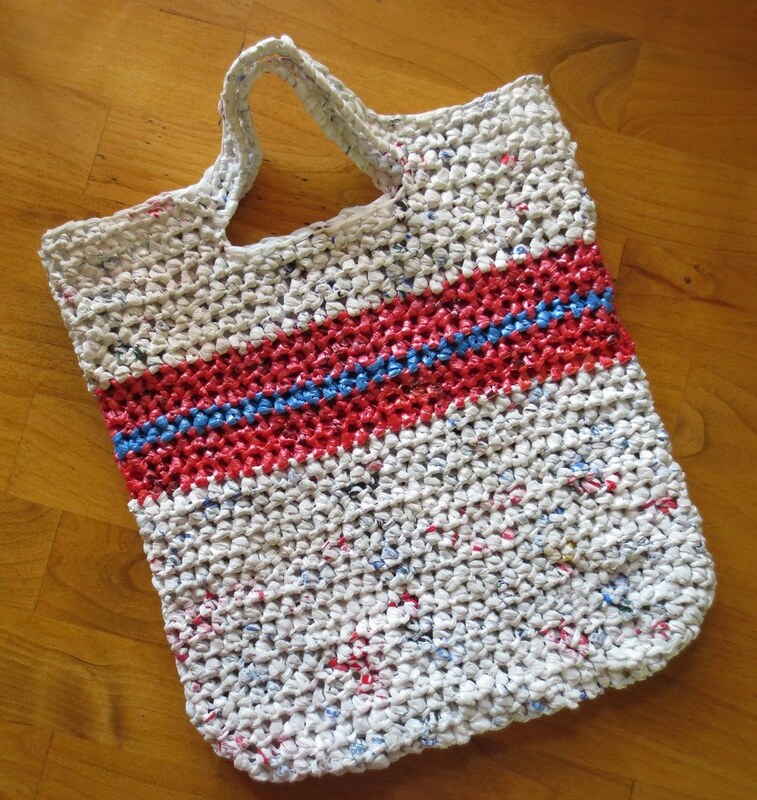 I used my ultimate recycled grocery tote pattern to crochet this bag. I just added three rows with pink recycled plastic bags or plarn, one row with blue, and then three final rows in pink again before switching back to white plarn. Finding the colored plastic bags isn’t easy and just a few can spice up a plain white tote bag such as this one. Plus I always like to use pink in my projects that I crochet for Relay for Life in support of breast cancer awareness. This crocheted recycled tote bag measures 12 inches wide, 14 inches long and with 9 inch handles. I used 12 pink plastic newspaper sacks and 2 small blue plastic sleeves for the stripes. The white portion of this recycled bag was crocheted from about 30 plastic retail bags. All the plastic bags were cut 1 inch wide and the plarn (plastic bag yarn) was made using these plarn making tutorials. Very very .. nice bag. Thanks for sharing with us.